Amon Simutowe of Zambia participated in the 10-round Hastings Challenger's tournament taking place in England. IM Simutowe, who just turned 20-years old on 6th January, made a strong showing with 6½-3½, but weak pairings after a first round loss appeared to have caused his disqualification for a GM norm. Amon appears to be rounding back into form after a year of mixed results. By all indications, he will be focused on the last norm as he charts a course for his future. Also participating in Hastings Challengers tournament is the teenage sensation from England, Sabrina Chevannes. A former under-13 Champion, she played in perhaps her biggest test and scored 3-7. This tournament will certainly be one from which she can build on for the success that is certain to come. Press on Sabrina!! 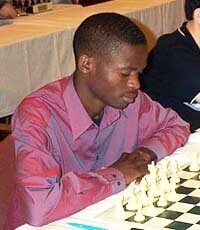 Amon Simutowe's quest for GM title at Hastings 2002 (after round 9). Round 1: IM Simon Williams (England)-Simutowe, 1-0. Round 2: Simutowe-Jeremy Menadue (England), 1-0. Round 3: Roger DeCoverly (England)-Simutowe, 0-1. Round 4: Simutowe-NM Bjorn Thorfinnsson (Iceland), 1-0. Round 5: IM John Shaw (Scotland)-Simutowe, ½-½. Round 6: Simutowe-FM Jurgen Brustkern (Germany), 1-0. Round 7: GM James Plaskett (England)-Simutowe, 0-1. Round 8: Simutowe-GM Glenn Flear (England), ½-½. Round 9: GM Vitaly Tseshkovsky-Simutowe, 1-0. Round 10: Simutowe-IM Aimen Rizouk, ½-½. Notes: Didn't qualify for a GM norm because the average ratings of his opponents were lower than minimum required. However, Amon played well and did not suffer any major letdowns during the tournament. This is encouraging news. There is an international consensus that IM Simutowe has not played his best chess yet and better things are yet to come from the young Zambian! Simutowe has been invited to the Donald Byrne Invitational in the USA where he can qualify for his last GM norm.